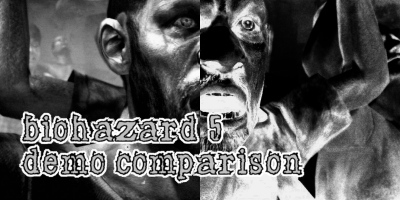 What follows is a comparison of the Biohazard 5 demos which were recently released for the Xbox 360 and the Playstation 3. What you should keep in mind when viewing the pictures below is that, as of the publishing of this article, the game still has three months of development time and any of the things you see below could very well be changed by the time the game is released. Another thing you should note is that I took these shots through component video output on both consoles. Its common knowledge that the Xbox 360 has a sharper output that the Playstation 3. As with most multi-platform releases, it's standard practice for different platforms to be on different build releases as they are created. So while these two demos were released just a few weeks apart, it's very likely that one of them is using old assets and code, which may help explain some of the differences. Also worth mentioning is the fact that you aren't viewing these screenshots in an uncompressed format, however the same compression levels were used for each version. Before we begin the comparison, I'd like to give a little history of how the demos were released to the public. The Xbox 360 demo was released first on December 5th, exclusively on the Japanese Xbox Live Marketplace. The demo was free to download, regardless of the console region for around 12 hours. After this short window, Capcom had began taking measures to insure that only Japanese 360 owners would be able to play it. Firstly, any new downloads of the demo would be met with a screen denying you access to the download. We assume the 360 was detecting your IP address and denying anyone outside of Japan. Since the demo had since spread to torrent sites, Capcom took things a step further and signed you out of Xbox Live whenever the demo was loaded. While this disabled online play, users were still able to play Single Player, and Local Co-op. This was short lived however, when Capcom activated a nasty flag, which would corrupt the demo if you loaded it while connected to Xbox Live. Thus rendering the demo completely useless. Its also interesting to note that one user reported that he had encountered similar problems despite being a Japan resident, on a Japanese console. Meanwhile, the Playstation 3 version was released (on disc only) on December 18th. It was only available to new buyers of the Playstation 3 from the 18th onward. 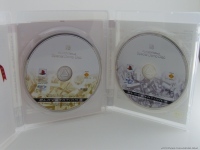 Owners were given the option of getting either a "White" demo disc, or a "Red" demo disc. 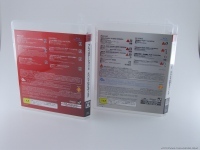 The red demo disc, rated CERO A, mostly contains family friendly titles. 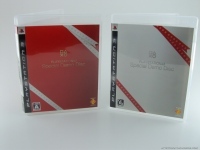 The white demo disc contained mostly CERO D rated games, including the Biohazard 5 Demo. So, with that out of the way, lets get into the comparison. Interestingly, the White demo disc is both a video and game hybrid disc. When you launch the game section, it allows you to install the demos straight from the disc. It first copies the install package to your PS3, then lets you launch the demo without using the disc anymore. The Playstation 3 demo is considerably larger than its Xbox 360 counterpart, though I couldn't find a reason for this as of the publishing of this article. We'll start by running through the Shanty Town stage. When I first began comparing the images I had captured against each other, I was immediately struck by the color timing differences. The Xbox 360 version seems to have more of a green tint to it, and the Playstation 3 seems to have more of a red tone. To my eyes, the Playstation 3 version looks a bit more natural, but this is entirely up to your viewing preferences. Click on the image, and mouse over on the picture that pops up for an automatic mouse-over comparison. 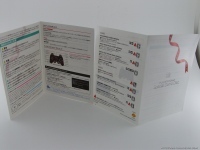 The Xbox 360 version will be displayed first, and the Playstation 3 version will be shown upon mouse-over. Looking around further, I noticed that the shadows on the Playstation 3 version seem to be running in a lower precision mode, and in some area's they are not cast as heavily as the Xbox 360 version. Moving into the cabin reveals that the 360 version has some better looking shaders and textures on the meat piles that are on the tables. The skulls seem to be affected as well, but this could just be the default sharpness output making that difference. Moving outside, we get the first cutscene. The volume of smoke that billows out in the background of the stage is not as full in the Playstation 3 version. Both versions of the game suffer from the artifacting that is a hallmark of the MT Framework engine on the consoles. Thanks to the higher precision motion blur on the PC, this isn't an issue. You can also see some more shadow differences on the rebar and columns. After viewing more textures that seemed to be lower resolution, it appears as if this may just be limited to certain shaders, or specular maps. It could possibly be a limitation of the MT Framework engine when running on PS3. Moving on to the Public Assembly stage, it became apparent that the PS3 version is lacking certain effects. Included in this are the heat haze effects, dust particles and a lack of self shadowing on hair and the majini's head. Also, it appears that certain majini have lower resolution textures on them in the PS3 version. Interestingly, the Executioner seems to have more shadows on him on the Playstation 3 version. No screenshot better illustrates the differences but this one, complete with lack of smoke and heat haze on the Playstation 3 version. An issue with the Xbox 360 version is the screen tearing. It rears its ugly head quite often on the Xbox 360. I haven't seen any screen tearing on the Playstation 3, but I have noticed more framerate dips on it compared to the couple of times it hits the 360. I assume that the Playstation 3 has v-sync enabled by default, thus rather than tearing the screen, you'll get frame drops. Another shot shows the lack of dust that kicks up on the 360 version from the majini. Here is another shot showing the lack of self shadowing on the Playstation 3. Note Sheva's headset, and hair. In summary, at this time, it appears that the Xbox 360 version is a few builds ahead of the Playstation 3. We look forward to revisiting the results when the games are released at retail and finished. For now, treat the results as temporary. The gulf of difference, when viewed in motion, is not as large as I had expected. In fact, I was quite surprised when I went back and looked at the screenshots. Going from one to the other, I really couldn't find these subtle differences between the two versions until I compared screenshots directly. This article was done with the interests of multi-console owners in mind. Those who have both the 360 and PS3 whom still haven't made up their mind as to which version they should get. I will update the article as necessary. Members of THIA can expect a video comparison in a short while. Finally, here are some random shots from similar locations.